Opposites definitely attract. So is it any wonder that mixing edgy and romantic styles results in swoon-worthy outfits? The right pairings can have you expertly blending these two styles and reaping some serious style benefits. Here’s how to wear edgy and feminine styles together. Reach for a distressed pair featuring floral embroidery for denim that’s both edgy and feminine. Ripped and distressed jeans with frayed hems work equally well with bohemian blouses or a slinky, silk camisole. Reverse the recipe by reaching for colored denim in a romantic hue, like dusty lilac or blush pink, and choose a top that’s a little rough around the edges like distressed tees or a leopard-print pullover. Start with feminine frocks as a simple base and leverage supporting elements, like shoes and clever accessories, to give things an edgy twist. Take a cue from spring and wear a classic wrap dress with a pair of ankle booties or fashion sneakers for a more casual interpretation of edgy-meets-fem. Or go glam with a slinky, metallic slip dress and add a pullover sweatshirt and rocker-inspired studded booties. The perfect jacket can instantly up the edgy ante. From bombers to motos and classically-cool denim jackets, (bonus points for a waxed cotton style for that leather-look) we recommend you layer them over whimsical closet staples like lace tees, silky blouses or fancy floral motifs. Stylist tip: Want to double up on your style-mixing-savvy? Try your hand at print mixing and add a statement leopard coat over a dainty floral top. Ready to channel your inner rocker-meets-debutante? 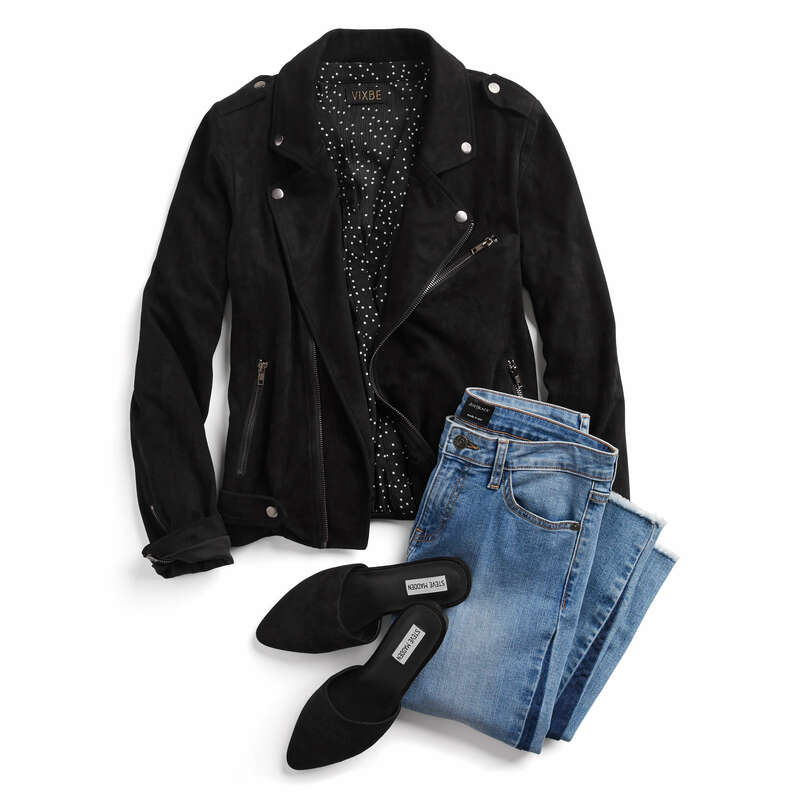 Go on, add leather to fancy florals or lace to distressed denim. Wondering where you land on the style spectrum? Take your Style Quiz to see!